Come to explore Pikes Peak, but stay for the countless additional attractions just a short drive from our Colorado Springs hotel. A brand new property open in autumn 2014, the proximity to Denver is a big reason many travelers choose to stay in Colorado Springs, Colorado. However, it's the incredible outdoor recreation, from discovering the Garden of the Gods to the Black Forest, which makes for the vacation of a lifetime. Whether you're here on military business with the nearby US Air Force Academy or on business with the University of Phoenix, it's easy to make time for some entertainment, rest and leisure. Sports events at the Air Force Academy such as football bring fans from around the region, which is why our Colorado Springs hotel offers competitive rates and blocked rooms for big groups. Close to shopping malls, you'll be close to the best shopping in the area if that's more your sport. From the US Air Force Academy Games to lectures at Regis University, this newly renovated property is the only Best Western Plus in the Colorado Springs area. We cater to weekenders and those who need an extended stay alike. Students, faculty and staff at the USAA and Air Force Academy deserve a genuine home away from home with spacious, cool rooms and all the amenities. That's what our friendly staff provides whether you're here for a night or a few months. 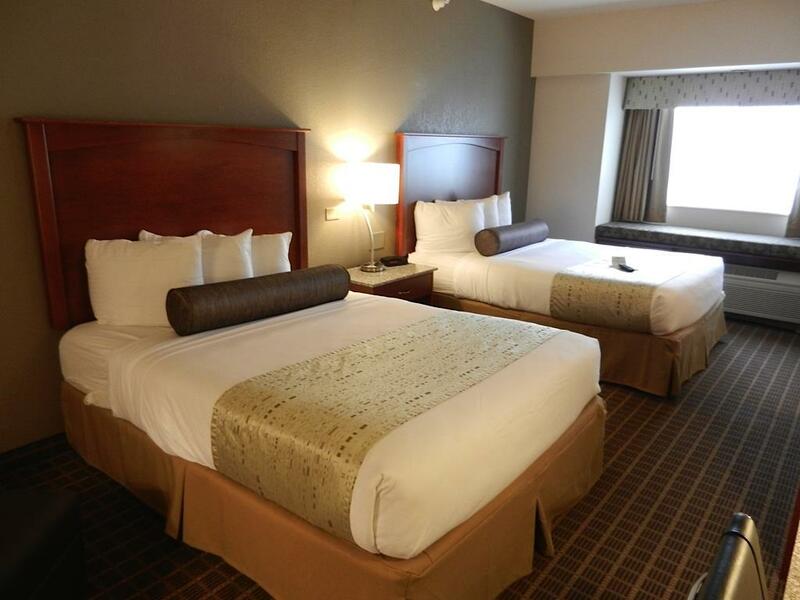 Enjoy the convenience, affordable rates and cleanliness that Best Western is known for. There's the allure of the big city a day trip away, but the equally enticing recreational opportunities a few miles away. You'll find something for everyone at this welcoming Colorado Springs hotel. Reserve your upcoming stay at Best Western Plus Peak Vista Inn & Suites to take advantage of the newest hotel in town! From: Denver International Airport. Take 470 West to I-25 South and take Exit 149. Then make a right turn onto Commerce Center Drive and the Best Western Plus Peak Vista Inn & Suites is just ahead. From: New Mexico. Take I-25 North to Exit 149 and make a left turn under the overpass. Then make a right turn onto Commerce Center Drive and the Best Western Plus Peak Vista Inn & Suites is just ahead. The Promenade Shops at Briargate,5 mile(s) from The Promenade Shops at Briargate, feature: Ann Taylor , Apple, Banana Republic, Bath & Body Works , J. Crew , Jos.A. Bank Clothiers, LOFT and many more. Outlets at Castle Rock,35 mile(s) from Outlets at Castle Rock, Coach , Michael Kors , adidas , Levy's, LOFT , Timberland , Columbia and many more. Chapel Hills Mall,5 mile(s) from Chapel Hills Mall, H&M, Aeropostale, Hollister Co. , Pacsun , Kay Jewelers, Macy's , Sears and many more. Current ,1 mile(s) from Current , address labels, wrapping paper, greeting cards and more. Garden of the Gods.4 mile(s) from Garden of the Gods. From interactive exhibits to walks, talks, hikes, and tours, enjoy Colorado's most photographed views. Learn how the amazing red rocks got there with the HD movie, award winning gift shops and balcony cafe. A must see! Cheyenne Mountain Zoo.12 mile(s) from Cheyenne Mountain Zoo. America's only mountain zoo! All of your favorites are here- orangutans, hippos, tigers, elephants and bears (oh my!). Hand-feed our huge giraffe herd, and experience animals up-close, like never before. Historic Old Colorado City.10 mile(s) from Historic Old Colorado City. With over 100 fine galleries, specialty shops, boutiques, restaurants and services available, Old Colorado City is a great destination for your family. Historic Manitou Springs.10 mile(s) from Historic Manitou Springs. Enjoy a delightful day at the foot of Pikes Peak. Whether drinking from the mineral springs, shopping, dining, hiking, exploring or just relaxing, the options are endless in Manitou Springs. Seven Falls.12 mile(s) from Seven Falls. Seven cascading falls set in a magnificent box canyon. Hiking, self-guided audio tours, wildlife viewing, scavenger hunt for kids, plus, take an in-mountain elevator to the perfect view. Royal Gorge.50 mile(s) from Royal Gorge. Marvel at awe-inspiring views from one of the world's highest suspension bridges. This family-friendly attraction has been creating fun and memories for 85 years with world-class attractions, food, and shopping. Manitou Cliff Dwellings.10 mile(s) from Manitou Cliff Dwellings. Walk through history exploring authentic Anasazi cliff dwellings. A hands-on educational experience perfect for families. A great place to get out and touch history! Pikes Peak Cog Railway.25 mile(s) from Pikes Peak Cog Railway. Since 1891, world's highest cog railway ascends Pikes Peak, 14,115 feet. Train winds past waterfalls, through aspen and pine forest. Cave of the Winds.10 mile(s) from Cave of the Winds. Discovered in 1881, Cave of the Winds has been a premier Colorado attraction for more than a century. With two guided cave tours, thrilling outdoor attractions and lots to do for all ages- we've got fun covered! North Pole.20 mile(s) from North Pole. Christmas never stops at Santa's Workshop! This Christmas-themed family park located at the foot of Pikes Peak is a great adventure for kids of any age.